A two-story house of frame construction was built at the plantation by William Hilton. It may have also served as a tavern known as High Hills Tavern (7, pp. 2, 15, 20) (8).
?  William Moore transfered ownership to Adam F. Brisbane (7, p. 9). 1780-1781  The house served as headquarters for both Lord Cornwallis and General Nathaniel Green during the Revolutionary War (1) (7, p. 2). 1792  Thomas Hooper purchased the plantation from Adam F. Brisbane and his wife Mary (7, p. 9, 21). 1802  Mary Heron Hooper became owner of the plantation after the death of her husband, Thomas Hooper (7, p. 9). 1820  The niece and adopted daughter of Mary Hooper, Mary Jane McKenzie Anderson and her husband, Dr. William Wallace Anderson, became owners of Borough House Plantation after the death of Mary Hooper (7, p. 9). 1821  Dr. William W. Anderson added the wings to the house and several outbuildings using pisé de terre (rammed earth) construction (1, pp. 2-3) (7, p. 2). 1864  Dr. William Wallace Anderson passed away and was proceeded in death by first wife Mary Jane in 1832. Dr. Anderson had remarried in 1833 to Elizabeth Waites in and willed Borough House Plantation to Elizabeth until her natural death then it was to go to his eldest son, General Richard H. Anderson (4) (7, p. 9). 1865  The house was spared from being destroyed during the Civil War by Union commander Colonel Potter. Potter was a Mason and upon learning that Elizabeth Anderson was a member of the Eastern Star, the women's Masonic organization, he ordered his troops not to burn the house but allowed them to plunder the plantation (7, pp. 23-14). 1877  Virginia Childs Anderson, wife of Dr. William Wallace Anderson II, became the plantation's owner. It is not clear if she purchased Borough House from the estate of Dr. William Wallace Anderson after Elizabeth's 1876 death or from the son, her husband's brother, General Richard H. Anderson. It is also unclear if Virginia owned the plantation solely or jointly with her husband (7, p. 9). 1912  Virginia Childs Anderson passed away (her husband Dr. William Wallace Anderson II had died in 1911) and willed the plantation to son William Wallace Anderson III who gave title to his sister Ann Catherine Anderson Saunders. Ann Saunders and her husband purchased adjoining property to greatly increase the size of the plantation (7, p. 10) (8). 1923  Ann Catherine Anderson Saunders gave the plantation to daughter Mary Virginia Saunders White (7, p. 10). 1946  Mary Virginia Saunders White converted the plantation from growing cotton to a timber managed tree farm. 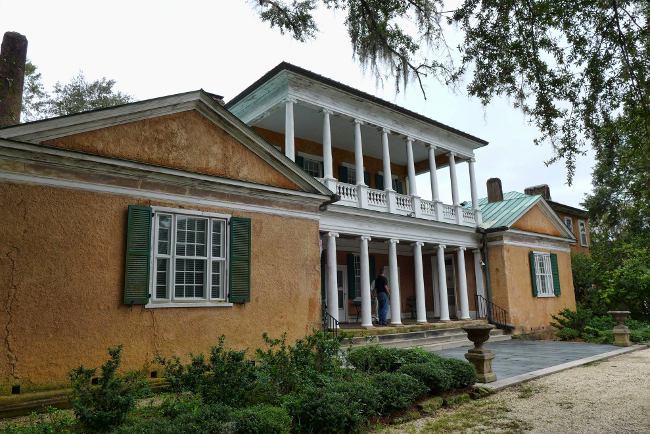 The Borough House Plantation was the first farm of this type in South Carolina and holds Certificate No. 1 from the South Carolina Tree Farms System (7, p. 10). 1959  Mary Virginia Saunders White died and left Borough House Plantation to her daughter Mary Greenleaf White Anderson. Mary Anderson was married to Richard K. Anderson the great-grandson of Dr. William Wallace Anderson I (7, p. 10). 1972  Mary White Anderson was still owner of record. She passed away in June 2016 (1, p. 1) (10). 2016  Borough House Plantation is still owned by Anderson family descendants (9). Slave List and Workers List - this list is a compilation of slave records kept by Dr. Anderson for Borough House Plantation. They span several decades and were updated to include surnames as listed in the 1870 and 1880 censuses of those that remained at Borough House as contract workers after the Civil War. This file also includes birth years, mothers' and fathers' first names when available, and is grouped by families. The house and accompanying outbuildings are the largest remaining complex of pisé de terre buildings in the United States (1, p. 13). Information contributed by photographer Gazie Nagle. Obituary of Mary Greenleaf White Anderson.